Tim will shortly graduate from the Sydney campus of the University of Notre Dame Australia. He has varied interests in oncology, surgery and radiology. He also enjoys playing sport, riding his motorbike and fine dining. Figure 1. Contrast enhanced abdominal CT scan: coronal section. This image demonstrates the ovoid hypodense filling defect in the IVC distal to the renal veins. The thrombus is expanding the cava (red circle). 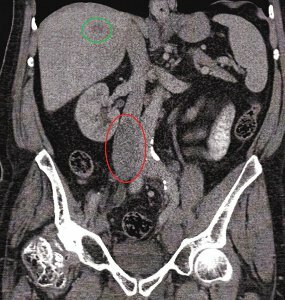 Note also the hypodense metastatic deposit in the liver (green circle). This case report identifies an IVC thrombosis in a patient with stage IV prostate cancer. The case demonstrates hypercoagulability as one of the many complications of malignancy. The patient presented clinically with bilateral pitting oedema to the groin and into the scrotum with dilated superficial abdominal veins. The prostate cancer was aggressive and unresponsive to anti-androgen therapy and brachytherapy. The latest staging CT and bone scans revealed diffuse disseminated disease and a caval thrombus. He is now receiving chemotherapy as an outpatient and unfortunately his prognosis is unfavourable.